Have you ever asked yourself what it would feel like to be able to breathe under the water? If you what to find out but are still not prepared to commit yourself to a certified course, Discover Scuba Diving or a Try Dive, will let you try diving and discover a new world. 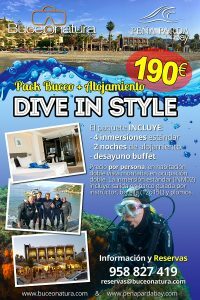 Although you will not receive a certification, during Discover Scuba Diving or a Try Dive, you will learn how to use the equipment and receive a quick and easy introduction to all that you need to know to explore the underwater world. Theres nothing like breathing under the water for the first time. It will take time for you to adjust yourself – after all, humans weren´t made for this – although after a few minutes of suprising amazement, most people realise how easy diving is. The biggest challenge of instructors is not getting people in the water, it´s persuading them to get out again when the course is finished! And the fun part? It´s all fun! In addition, you can gain credits, if your Discover Scuba Diving includes a dive in Open Water, your experience can count towards an Open Water Diver certification, placing you one step ahead if you decide to do the course. Your disposition and complete attention. You need to be at least 12 years old.